Photo courtesy of Don Stine Communications & Photography. Nampa, ID (October 20, 2016) – Premier Equestrian, a leading supplier of high-grade footing, striking dressage arenas, and revolutionized horse jumps, recently recognized Beth Noteman for her exemplary horsemanship by presenting her with the Premier Equestrian Award at the 2016 Sport Horse National Arabian & Half-Arabian Championship Horse Show held in Nampa, Idaho. Premier Equestrian presents the award at shows across the United States to honor talented equestrians who demonstrate stellar horsemanship and sportsmanship, and promote positivity in and outside of the show ring. Noteman stood out to the show committee as a well-rounded equestrian whose attention to the sport goes beyond her scores in the show ring. A talented rider and handler who has achieved remarkable success with her Arabians, particularly her renowned stallion HSA Haleys Comet++++//, Noteman has said that she is most proud of the fact that her horses lead happy and healthy lives. She strives to make every show a positive experience for her equine partners, and her close connection with her horses is anchored in genuine enjoyment of their company and a deep respect for their individual temperaments and capabilities. In addition to the sheer amount of patience and hard work that she has put in over the years, the show committee was impressed with Noteman’s flexible attitude in understanding and working with the core personality of each of her mounts. Noteman, who believes that adaptability and a down-to-earth attitude is essential to achieving success as an equestrian, learned the importance of recognizing a horse’s potential when she purchased Arabian stallion HSA Haleys Comet++++// (Skamper x Ok Ellazella G) as a green four-year-old in 1999. “Comet” did not fit her vision of an ideal dressage mount, but Noteman was willing to compromise based on the recommendations of her trainers – and despite the unlikely pairing between an amateur rider and a green stallion, Comet turned out to be the horse of a lifetime. While working 12-hour days in order to fund her riding as an amateur, Noteman brought Comet up the ranks to win the most National Championships of any purebred Arabian Stallion in history. Her tenacity is an inspiration to amateur equestrians, proving that with a little luck and a lot of hard work, all riders can achieve the dream of Arabian horse ownership. Over the past few years, Noteman has expanded her horse family by purchasing Comet’s son, Comets Midnite Bandit (known as “Bandit”) and Bandit’s mother, Midnites Magic Genie (known as “Magic”). She competed on this Half-Arabian, Half-Friesian mother-and-son duo at the recent 2016 AHA Sport Horse National Championships, riding Bandit in First and Second Level dressage and Magic in Fourth Level and Prix St. Georges dressage. In honor of being dubbed a “Premier Equestrian,” Noteman was presented with a tricolor ribbon and the Premier Equestrian engraved plaque. Premier Equestrian is proud to reward talented riders like Noteman, who bring a positive attitude to equestrian sports and demonstrate true enjoyment of their horses both inside and outside of the show ring. The company offers an affordable choice for first-rate American-made products that enhance the equestrian performance of its customers. For more information about Premier Equestrian and its full line of products including footing, dressage arenas, and horse jumps, visit www.PremierEquestrian.com or call 1-800-611-6109. South Jordan, UT (October 3, 2016) – Amateur rider and handler Karin Hansen’s generous spirit was recently rewarded by Premier Equestrian, a leading supplier of high-grade footing, striking dressage arenas, and horse jumps. At the International Andalusian and Lusitano Horse Association (IALHA) National Championship Show in South Jordan, Utah this September, Hansen excelled in the competition arena, exhibited exceptional sportsmanship, and demonstrated true horsemanship. Premier Equestrian values outstanding competitors such as Hansen and strives to recognize their exemplary character by presenting them with the Premier Equestrian Award. At the IALHA National Championships, Hansen competed with her two Andalusian horses, Padre and CDC Corazon. One-year-old filly Corazon, affectionately called “Cora,” competed in-hand and won the National Championship Spanish Fillies, 2 Years & Under. Cora also took top honors in the Get of Sire and Produce of Dam. Padre was honored with Reserve National Champion Geldings All Ages (Amateur to Handle) and Reserve Champion Andalusian Western Pleasure (Amateur). Padre also earned National Top 5 honors in Working Equitation. Premier Equestrian – an industry leader in manufacturing world-class footing, stylish horse jumps, and quality arenas – strives to recognize competitors whose efforts in competition match their exceptional attitude and horsemanship. Known as “Premier Equestrians,” winners of the Premier Equestrian Award are presented with a striking tricolor ribbon and engraved Premier Equestrian Award commemorative plaque. “The IALHA National Championship Show has such a positive vibe,” commented Hansen. Her bright personality was appreciated by her fellow competitors on more than one occasion during this year’s competition. For each of the classes, there are specific pieces of equipment that each horse and rider are required to wear. Hansen explained that a fellow rider forgot her required chaps, and was going to have to miss her chance to ride for a championship. Hansen stepped up and offered the chaps she was wearing. “Her class was right after mine. The minute I got out of the class, I just sat down, ripped off my chaps and put them on her. It was really cool to be able to share.” Later in the day, another rider wasn’t wearing a broach and was going to be held out of the class. Hansen noticed the conversation happening and offered the broach she was wearing, saving the day for another competitor. Premier Equestrian wishes for all disciplines of riders, such as Hansen, always have an enjoyable experience with their horses, in or outside the show ring. The company is proud to offer an affordable choice for first-rate American-made products that enhance the equestrian performance of its customers. For more information about Premier Equestrian and its full line of products including footing, dressage arenas, and horse jumps, visit www.PremierEquestrian.com or call 1-800-611-6109. Chris Von Martels with Divertimento (Photo courtesy of JRPR). Wellington, FL (February 19, 2016) – Canada’s 2015 Pan American Games team silver and individual bronze medalist Chris Von Martels is known not only for his exemplary skills in the saddle, but also for his professional conduct and humble attitude towards his achievements. Premier Equestrian, an innovative company known for providing advanced riding arena systems throughout the United States, recognized Von Martels for his many accomplishments this past year at the highest level of dressage and rewarded him with the title of “Premier Equestrian” at the 2016 Adequan Global Dressage Festival in Wellington, Florida. Premier Equestrian presented Von Martels with a tri-colored ribbon, an engraved plaque, and the title of “Premier Equestrian” for his exemplary skills, sportsmanship, and achievements in the dressage world. Von Martels, of Ontario, Canada, is consistently a strong contender at the Grand Prix level in prestigious competitions. He is based in Wellington during the winter, where he trains with fellow Canadian Ashley Holzer. Von Martels has a few star equine partners at the Adequan Global Dressage Festival this season. Later this season, he plans to get his two-time Pan American Games medalist partner Zilverstar, a 12-year-old KWPN gelding, back into the show ring. He also plans to compete with his up-and-coming Grand Prix mount Bellissimo, a 13-year-old Danish Warmblood gelding. Von Martels is now actively campaigning with Divertimento, a 14-year-old Westfalen gelding also known as ‘Divert,’ who previously competed on a Swedish Nations Cup team with Swedish Olympian Tinne Vilhelmson-Silfvén. “Divert and I are a new combination since just around the holidays, and we are all very excited and hope to have some great results in the future,” Von Martels said. The Premier Equestrian Award will be presented each CDI week during the twelve-week Adequan Global Dressage Festival to honor riders who are not only competitive, but also kind and gracious to other competitors and show staff, put their horses first, and contribute to a positive overall atmosphere on the show grounds. Premier Equestrian hopes that this award will let competitors know that their outstanding attitudes are noticed and appreciated, and will encourage all riders to enter the show ring in winning spirits. Premier Equestrian is proud to offer continued support of the dressage community as an Official Partner and Sponsor of the 2016 Adequan Global Dressage Festival show series. The company offers high-quality and affordable products to dressage riders – including premier dressage arenas, world-class arena footing, revolutionized horse jumps, and accessories. For more information about the presenter of the Premier Equestrian Award, visit www.PremierEquestrian.com or call 1-800-611-6109. San Diego, California (January 8, 2016) – As a series of storms pummel California this week with one of the strongest El Niño weather systems on record, many equestrians find themselves extremely limited with the excess of flooding in paddocks and riding rings. However, with early preparations to the warnings of the upcoming El Niño year, some wise equestrians have installed an elite arena system that allows them to “walk on water” during this massive storm. U.S. Olympian Steffen Peters knew that selecting an arena footing system for his California training facility was of utmost importance, especially with the threat of harsh storms and heavy rain. That’s why he chose to train on riding surfaces provided by Premier Equestrian, a leading industry innovator in arena footing. Steffen selected the advanced OTTO Sport arena. Premier Equestrian is the exclusive North American distributor for German based OTTO Sport-und Reiplatz GmbH. Now, even through the record-tying flooding, potential flash floods, and mudslides, Peters’ facility continues to function smoothly with riders and horses out and about training on the Premier Equestrian and OTTO Sport arena system. “OTTO Sport offers a system of drainage, concussion relief, biomechanics benefits, and longevity,” said Heidi Zorn, President of Premier Equestrian. “The OTTO Sport system is a proven product that has been around for over thirty years. Many arenas are still standing and performing as well as they did the first day the system was installed thirty years ago.” This is why several “Premier Equestrians,” riders like Peters who are people dedicated to the development and preservation of horse sport, have chosen to put the OTTO Sport system under their winning horses’ hooves. The OTTO system centers on the OTTO Sport Perforated Mat. This arena base mat system provides maximum drainage, concussion mitigation, stability for horse and rider, and a proper and durable separation of footing and substructure. 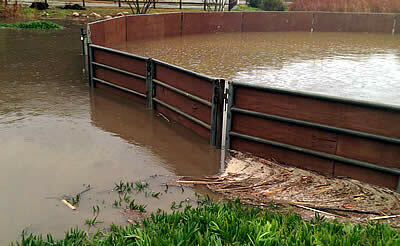 Drainage holes in the mat remove excess water quickly, making the arena useable immediately after persistent rain. Built-in reservoirs hold enough water to rehydrate the footing later. These features make the OTTO Sport Perforated Mat System universally suited for any arena or farm in the world, and crucial in times of extreme weather. Another key factor in Peters’ arena is the revolutionary Premier HT footing, which stands for Hydration Technology. This is a programmable textile footing that can be configured to uptake water at different levels and rates. The HT footing drastically reduces the amount of water needed to maintain an ideal riding surface, and reduces the amount of time spent maintaining the arena. Premier HT will always maintain the appropriate hydration whether it be drought or flood conditions. Even while riders enjoyed schooling in the OTTO Sport arena at Arroyo Del Mar, the facility’s round pen – without the OTTO Sport arena system provided by Premier Equestrian – was rendered unusable after the intense El Niño storms. Peters and his wife, USDF Gold Medalist Shannon Peters, believe that this advanced arena system and footing are essential, and their arena has truly proven its worth throughout the series of intense El Niño storms. Peters continues to train with Akiko Yamazaki’s Legolas 92 and Rosamunde 20, while the majority of the Californian equestrian population without the arena system is virtually stall bound. Yamazaki, another Premier Equestrian, also planned ahead and installed the OTTO Sport arena system before the storms hit. Peters and Yamazaki were originally introduced to the OTTO Sport arena system at the 2006 Word Equestrian Games in Aachen, Germany, where the system held up against two weeks of heavy rain. Dave Martin of Footings West, who worked with Premier Equestrian to install the OTTO Sport arena at Peters’ facility Arroyo Del Mar, has been paying close attention to the arena’s maintenance during El Niño. Martin states, “The Arroyo Del Mar arena is the only outdoor arena in all of southern California that is 100% usable even for heavy equipment. The performance of the OTTO Sport arena system is beyond anything I have ever seen in my 35 years of arena construction,” he remarked. Founded in 1999, Premier Equestrian is the Official Dressage Arena of the United States Equestrian Federation and the United States Dressage Federation. For more information about Premier Equestrian, visit www.PremierEquestrian.com or call 1-800-611-6109. To see more news about this press release, visit http://premierequestrian.com/category/pressrelease/articles/PR-dry-heaven-in-midst-of-powerful-El-nino-storms.html. Marcus Orlob, on Shyriana, wins the Premier Equestrian Award at the Adequan Global Dressage Festival (Photo courtesy of JRPR). Riders who demonstrate these values will receive a lovely tri-colored Premier Equestrian Award ribbon, an engraved plaque, and the title of “Premier Equestrian.” Premier Equestrian is confident that this award will let competitors know that their outstanding attitudes are being noticed and appreciated, and will encourage all riders to enter the show ring with winning spirits. The award’s name is based on the title that Premier Equestrian uses when referring to the elite group of internationally successful equestrians who demonstrate positive attitudes and qualities – including Akiko Yamazaki, Linda Parelli, and dressage riders Steffen Peters, Laura Graves, Debbie McDonald, Adrienne Lyle, along with show jumper Luca Moneta. These official “Premier Equestrians” can serve as role models to those who aspire to earn the Premier Equestrian Award at the 2016 Adequan Global Dressage Festival. Premier Equestrian keeps an eye out for individuals like Wrigley at competitions like the upcoming South Florida show series to recognize those that demonstrate exemplary sportsmanship. Premier Equestrian is also eager for the 2016 Adequan Global Dressage Festival and the opportunity to show its support for the world of dressage. The company offers high-quality and affordable products to dressage riders – including premier dressage arenas, world-class arena footing, revolutionized horse jumps, and accessories. For more information about the presenter of the Premier Equestrian Award, visit www.PremierEquestrian.com or call 1-800-611-6109. Wellington, FL (December 18, 2015) – As a top athlete in his discipline, Steffen Peters will settle for nothing less than the best for his world-class horses. That’s why for the past two years, the dressage icon has trained his Olympic partner Legolas 92 and new rising star Rosamunde on arena footing provided by Premier Equestrian, the Official Dressage Arena of the United States Equestrian Federation and the United States Dressage Federation. Once again, Peters’ meticulousness in his riding and equine partners’ care and training has paid off at the 2015 U.S. Dressage Festival of Champions, presented by the Dutta Corporation this past weekend at the Adequan Global Dressage Festival show grounds in Wellington, Florida. After a four-year streak as the title Champion – winning in 2011 with Ravel and in 2012, 2013, and 2014 with Akiko Yamazaki’s Legolas 92 – Peters returned to the Festival of Champions this year with both Legolas and Rosamunde, Yamazaki’s eight-year-old Rhinelander mare that he began training in 2013 as a successor to Legolas. Both horses delivered outstanding performances during the three-day competition, overall capturing Peters both the Reserve Championship on Legolas and third place on Rosamunde in the Dutta Corp./USEF Grand Prix Dressage National Championship. Of particular note was Peters’ show-stopping performance on Legolas in the Grand Prix Freestyle. The flawless routine earned the pair an impressive score of 77.675 percent, prevailing over Laura Graves and Verdades, who came in first overall in the Dutta Corp./USEF Grand Prix Dressage National Championship standings. “It was one of my best freestyles,” said Peters, adding that he felt the performance was even stronger than the freestyle that won him the Gold medal at the 2015 Pan American Games. “It wasn’t just with the music, but with the footfall of every single beat,” he explained. “It was a very clean freestyle, and I’m extremely excited.” In the same competition, a score of 74.950 captured third place for Peters and Rosamunde, positioning the up-and-coming new talent just a hair’s width behind Graves’ and Verdades’ mark of 75.125 percent. Overall, Peters said he was thrilled with both horses’ performances, having scored 74.22 percent with Legolas and 72.62 percent with Rosamunde in the FEI Grand Prix Open on Wednesday. In Thursday’s FEI Grand Prix Special Open, Rosamunde stole second place from Legolas with a score of 74.549 percent, promising to be a worthy successor for the top international mount, who placed third at 72.412 percent. As the exclusive North American distributor for German based OTTO Sport-und Reiplatz GmbH, Premier Equestrian recently upgraded Peters’ facility with the advanced OTTO Sport arena system, which will be used next year in Rio de Janeiro, Brazil. The OTTO system centers on the OTTO Sport Perforated Mat, which provides maximum drainage, concussion mitigation, stability for horse and rider, and a proper and durable separation of footing and substructure. Concussion absorption and skid resistance protect the horse’s joints and tendons from debilitating, long-term damage. Peters currently uses solely Premier Equestrian footing products, including the new Premier HT textile footing, which uses hydration technology to dramatically reduce the amount of water needed to keep an arena properly maintained. Premier Equestrian is proud to sponsor top professionals like Peters, who the company considers a true “Premier Equestrian.” For more information about this industry leader in providing outstanding arena footing and equipment, visit www.PremierEquestrian.com or call 1-800-611-6109. Mill Spring, NC (August 7, 2015) – The Premier Equestrian 0.80m Low Jumper Division at the Tryon International Equestrian Center saw winning rides that showcased true partnership this summer. Premier Equestrian – the Utah-based maker of revolutionized horse jumps, expert arena footing, and exquisite dressage arenas – is passionate about the development of equestrian sports, and congratulates riders Mihkayla Shetterly, Shannon O’Hatnick, and Daniel Kerins for their winning rides in the Low Jumper Division sponsored by Premier Equestrian this past month. Mihkayla Shetterly and her mount Gypsy Queen made their A rated show debut in the Premier Equestrian 0.80m Low Jumper Division at the Tryon International Equestrian Center this summer in hopes of moving up to the Pony Jumper division in the next year. Gypsy Queen is no newbie to the jumper ring. A proven teacher, she has previously helped guide four different students through the levels in the past ten years. However, with her trainer’s encouragement, Shetterly returned to the jumper ring the next day. “She went right in there and won the Pro 0.80m, and then she won the Non-Pro 0.80m!” Kerr exclaimed. Already planning to return to Tryon for a couple weeks next season, Shetterly and Gypsy Queen’s successes will be a story to follow in the upcoming months. Shannon O’Hatnick won the Premier Equestrian 0.80m Low Jumper Division on Solar Flare, a twelve-year-old Thoroughbred/Trakehner mare known as Willow. The pair trains with Christen Khym. O’Hatnick beamed with pride for Willow after their victory. “If I had to put it in a few words, I’d say that each second of every ride I am always beyond proud of the heart and effort she always gives me. Winning is just a nice treat for a happy finish,” she stated. “The show was run impeccably and the facility was the nicest I’ve been to yet,” she added about the Tryon International Equestrian Center show grounds. Under the guidance of his father and trainer Darragh Kerins, Daniel Kerins competed with his 12.2 hand pony, Gentleman Jim. The twelve-year-old Welsh bred pony was imported from England three years ago, and has been with nine-year-old Kerins for the past six months. The young rider has gained some incredible experiences throughout the summer series at Tryon, taking home three first place finishes – including in the Premier Equestrian 0.80m Low Jumper Division – as well as a second and fourth place. “Daniel says Tryon was his favorite horse show in the world,” Kerins’s father commented. Premier Equestrian is honored to be part of the “family” at the Tryon International Equestrian Center, and to help horses and riders progress up the levels by sponsoring the show series. Premier Equestrian’s products are popular with riders of all levels, and are used in several of the world’s top competition venues. For more information about Premier Equestrian and the exceptional products the company has to offer, visit www.PremierEquestrian.com or call 1-800-611-6109. Sandy, Utah (June 9, 2015) – Truly successful equestrians settle for nothing less than the best for themselves and their horses. So it’s no surprise that out of all the dressage riders in the United States, the two who rank highest in the FEI World Individual Dressage Rankings love Premier Equestrian. Steffen Peters and Laura Graves, known as “Premier Equestrians” by this leading arena, footing, and jump manufacturer, are now ranked nine and ten, respectively, in the world. It is believed to have been at least six years since American riders have achieved two of the top ten rankings in the world at once – since July, 2009, in fact, when Peters was also one of the two top-ranked U.S. riders. In the FEI World Individual Dressage Rankings released on May 31, 2015, Peters and Legolas 92, a thirteen-year-old Westfalen gelding owned by Four Winds Farm LLC, moved from the eleventh slot to the ninth. The pair’s most recent successes include placing third at the Reem Acra FEI World Cup™ Dressage Final I Grand Prix with a score of 76.843 percent. Show ring victories don’t stop there for Peters, of San Diego, California. In his final show of the 2015 Dressage Pan American Games European CDI Observation Event Squad – a CDI4* Grand Prix in Achleiten, Austria – Peters took first place on his newer mount, Rosamunde. Their winning score was 74.560, only four months after Rosamunde (an eight-year-old Rhinelander mare owned by Four Winds Farm) began showing in the Big Tour. Laura Graves and her own thirteen-year-old KWPN gelding Verdades (Florett AS-Liwilarda, Goya) – who Graves got as a six-month old and has ridden to international success since – retained their tenth slot in the FEI World Individual Dressage Rankings since last month. Graves is currently focusing on training with Olympian Debbie McDonald, who is also a proud Premier Equestrian. 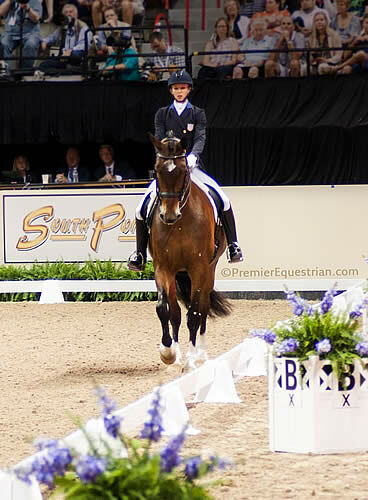 Graves and Verdades, who Graves calls “Diddy”, achieved a fourth place and score of 79.125 percent in the Reem Acra FEI World Cup™ Grand Prix Freestyle, and have not competed since. With that competition and her time in Hailey, Idaho with McDonald under her belt, the Geneva, Florida based Graves will be a formidable competitor in the 2015 Pan American Games in July. The company is globally recognized for its expert arena footing, premier dressage arenas, and revolutionizing horse jumps. The research behind Premier’s effective products, the materials they are created from, and the living testimonials of horses and riders who use them – like Graves, Peters, and McDonald – explain why Premier Equestrian is a leader in its market. Learn more about the company and its outstanding Premier Equestrians at www.PremierEquestrian.com. Jacksonville, FL (May 26, 2015) – Elizabeth Campbell was dubbed a true “Premier Equestrian” by leading arena and footing company, Premier Equestrian, at the May Day Qualifier One dressage show in Jacksonville, Florida. Campbell placed first in the FEI Intermediaire test with a 72.381 percent on her mount, Royal Diamant. Premier Equestrian presented Campbell with the title of “Premier Equestrian” for the excellent sportsmanship and dedication to the sport of dressage that she exhibited throughout the show. Campbell, a dressage rider and trainer out of Royal Blue Stables in Odessa, Florida, has had quite an interesting foundation to her equestrian career. Born in New Orleans, she then spent time in South America, England, and the Netherlands before finding her riding niche in Venezuela, where she rode in the western discipline for the next six years. It wasn’t until she reached the Caribbean that she was introduced to jumping and dressage. When an accident left her unable to continue jumping, Campbell made the complete transition over to the dressage world at the age of 23. Now 60 years old, Campbell expressed that she never wants to stop improving. “Every time I compete, there are more goals to reach,” she said. Campbell’s mount Royal Diamant, a 14-year-old German bred Warmblood, was purchased at the age of four completely sight unseen. Campbell recalled that she didn’t see a single video or picture of him before buying him, but had only his description to rely on – which included that he was “brown, and maybe had a white sock.” At the time, she said that she had gained an interest in buying and selling horses on a small scale and had heard that this horse had been presented to the Canadian team, but was turned away because he was too small. Premier Equestrian provides revolutionary horse jumps that are customizable, durable, and maintenance-free; world-class footing prepared to meet the needs of any location and use; and beautiful dressage arenas. Educational information, discounted arena packages, easy set-up, and completely horse-safe materials are just a few of the benefits that the company can offer. Notable “Premier Equestrians” who love the company’s products include Linda Parelli, Debbie McDonald, Steffen Peters, Adrienne Lyle, Laura Graves, Akiko Yamazaki, and Luca Moneta. 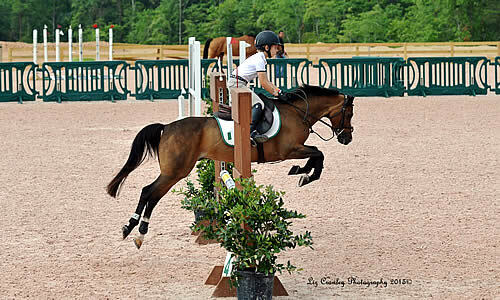 Premier Equestrian’s products are popular among riders competing at any level. For more information about Premier Equestrian and the exceptional products the company has to offer, visit www.PremierEquestrian.com or call 1-800-611-6109.